I loved going in here. It's really cool alot of stuff for cars. Nice radios. Navigations. They made my system sound really good! 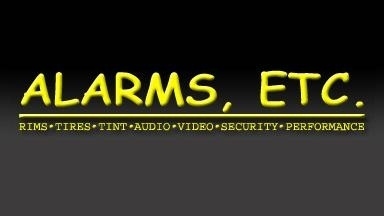 Lakeland Florida's #1 Car Audio / Window Tint / Mobile Video shop. ALARMS ETC. is Florida?s largest car stereo, car alarm and window tinting shop. For your convenience we have 3 locations located in Lakeland and Tampa FL. We take pride in every aspect of your vehicles installation. ALARMS ETC provides many products and services such as window tinting, Vinyl Graphics, Speakers, Spoilers, Car Neon Lights, XM Radio installations, GPS Navigation, Keyless Entry, Custom Wheels, Car Alarms, Body Kits, Vehicle Wraps and Video Screens just to name a few. And be self assured when it comes to car alarms we make sure to install it so thieves can?t find it, car audio we are the best stereo shop to troubleshoot when you have issues or we are here to provide perfect installation of your audio equipment. So no matter how basic or elaborate the task be rest a sure that ALARM ETC will do it right the first time. Call Today! Visit our website for a full list of services.